Matt_ wrote: As for being associated with the club not being very good. Which badge were we using in the promotion seasons of 1993/4, 1978/9 and 1974/5, heck we were even wearing it at the Britannia in the Conference season too. I am on about the last incarnation of the Loggerheads, the one which was the councils .eps file that the club added floret salopia to. It's all academic anyway Matt_ as there is no relevance between a badge and a club's on-the-pitch fortunes. People do not look at the Loggerheads and remember Kevin Ratcliffe and Dave Artell. It invokes images of local pride and a connection to our club's identity. Are you saying I am not a person? Just give it up on here lads. Ian is going to keep twisting everything you say to suit his bosses requirements and winding everyone up at the same time. Save your energies for asking straight yes or no questions, demand answers and just ignore waffle. Straight question Ian,intrigued to see if you have the nuts to answer honestly. Which would you personally prefer; A. lenny the logo or B. a badge containing the loggerheads in a 2 over 1 formation, but possibly with other things added ie river loop? Also is there a problem with bold/italic/underline options, because I don't seem to be able to use them and where has my avatar gone? Neil, I'm not twisting anything just expressing an opinion and acknowledging Geoff's thoughts on the repositioning the loggerheads into a single line. I can't really answer your question as I haven't got anything to compare it to? 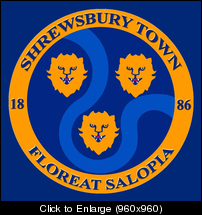 I've said before that personally I like the riverloop badge as to me that encompasses Shrewsbury and I don't like the last Loggerheads used as it was just a straight copy of the exisiting council badge. I don't mind the idea of loggerheads but I also am a big fan of the Shrew badge. how about these put out about a year or so ago? Ian. Could you answer a question for me in your official capacity as Media Manager please? What badge will be on the coming seasons shirts the lion, the Loggerheads or something else? neilsalop wrote: Ian. Could you answer a question for me in your official capacity as Media Manager please? 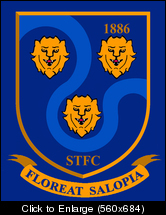 The current badge, Football League require confirmation of things like badges early in June.